Firstly we'd like to thank you all for your continued support over all of the years that the African Grey Parrot Centre has been running we couldn't have made this place the number one African grey parrot site without all of your help. So we thought it was about time we started communicating with our members on a more regular basis by creating a shiny new newsletter that hopefully will keep you up to date with what's happening on the site, that may be particularly important for all of you that just don't get the chance to get on as much as you would like, we know how it is. The newsletter may change over time but we hope to bring you the latest news, blog or rescue diary entry as a feature at the top of the email, then we'll do a weekly round up of what's been happening on the forum, what's hot, what's not kind of thing then we'll have a think about what other content we can bring to you, if you have any ideas about what you want to see then feel free to contact us and let us know, this is YOUR newsletter so make it your own. What is the best parrot food and why? There is no single answer to this question as many different types of parrot food are good for different reasons. However it is important to find out which foods are good and why because you never know what really goes into certain products. So what are the benefits and disadvantages of particular food groups? Seeds are a great source of nutrition for parrots. They are designed especially for parrots so the ingredients are not harmful in any way. Regular seed mixes of parrot food usually contain just plain old sunflower seeds which are high in fat and it is recommended that you try to stay away from these. More expensive mixes however, contain a large variety of seeds that are highly nutritious and very beneficial to your parrots diet. It is recommended that when buying seeds, always check to see the exact content of sunflower seeds. Please note although good, seeds should not make up too large a proportion of your Grey's diet, everything in moderation. Another type of parrot food commonly used and perhaps more nutritious than seeds are pellets. Pellets contain many more vitamins and minerals that will help your parrot stay healthy, live longer and have more overall energy. There is very little fat in most pellets found on the parrot food market but always check with someone if you are unsure of the ingredients. This type of parrot food is best mixed with fresh vegetables, which brings us to our next point. Fresh vegetables are definitely the best type of parrot food there is. Combining vegetables with vitamin rich pellets can make a huge difference to the health of your parrot. It will give him/her a great deal more energy and vibrancy than any other type of parrot food. So go out there and buy some fresh vegetables, chop them up finely so your parrot can eat them and mix in some specially designed pellets. Changing a parrots diet can do wonders for its personality! The last point to make note of is this, parrots are like children, they will eat anything they can get their beaks on. Some people believe that parrots are smart enough to know what is best for them to eat. Do not believe this as this is the first step to having a very unhealthy bird that will only live for half as long as it is suppose to. In the end it comes down to this, parrots must eat parrot food not human food! 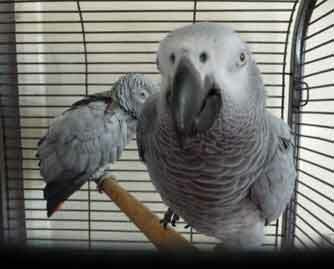 We have a whole section of the forum dedicated to the African Grey Diet where you will find numerous healthy diets and recipes like Irena our resident guru's Pellet Muffin Recipe or perhaps our very own Parrot Mash recipe, both of which you can make yourself to ensure your Grey stays as healthy as you and your family are, seeing as they are part of your family we feel strongly that they should be looked after as such. I'm Getting Gucci A Partner!!!! !